This is part five of my ClexaCon 2018 adventure. April 4-10, I went on a trip to Las Vegas for ClexaCon, all the way from The Netherlands. Let me tell you, it was so worth the jetlag! You can find part one, part two, part three, and part four here. In this ClexaCon 2018 Day 2 Cont. blog, I will tell you all about the Shoot and Hollstein reunions. Sarah and Amy came to the press room after their panel. I was also present at the red carpet event before the Cocktails for Change party. That means there will be much backstage footage this week! ClexaCon Saturday gave me such an adrenaline boost that despite the jetlag, the Ascension Party was no problem at all. PS If you need more info about what ClexaCon is, you should read my blog post ClexaCon 2018 in Las Vegas: The Media and Entertainment Convention for LGBTQ Women and Allies. So, yes, this was not the panel I absolutely had to attend because I love the show so much. However, this was my chance to finally see Sarah Shahi because, helloooo, Carmen…. I cannot tell you much about the POI stuff; all I can tell you is that that the view from the front was very, very nice. Amy and Sarah came to the press room after the panel. They shared a few laughs when posing for the photos and after that, they both sat down at a table to answer some questions. They stayed for quite a while actually, which was really nice of them. Naturally, the first question was about the L Word reboot. I also asked a question, the same I asked Dot-Marie Jones: if they were able to pick any award they could win, what would it be and why? Sarah jokingly named a few awards from countries abroad so that she could travel to beautiful places but when I asked her about awards for personal causes, she said that children and the LGBTQ community had a special place in her heart. Watch the interview material in my vlog (and subscribe to my YouTube channel)! Want to watch Person of Interest? You can find it on iTunes or buy the DVDs and Blu-ray at Amazon, eBay, Walmart, Zavvi or Bol.com. I am going to be honest again and confess that the Hollstein panel was my biggest reason for coming to ClexaCon. I started following this web series right before the second season dropped and so I was lucky enough to be able to binge watch the whole first season. As I had not told my wife about it, she was not really aware of this show. Then the second season came and subsequently, the third season came. And then there was talk about this movie. And then there was a crowdfunding campaign. Oh, and then I backed the campaign. And then the release date of the movie was getting closer and I got really excited. I thought it was so cool to see them on that stage! This panel was my little fangirl moment. My big fangirl moment came a few hours later when I was able to talk to them on the red carpet, although I did my best to hide my excitement. Go watch the red carpet vlog and let me know how good or bad I was at hiding the fangirl in me! I had to leave the Hollstein panel early as I wanted to secure a good spot at the red carpet event. 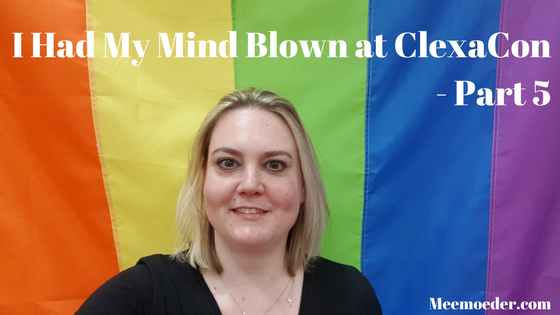 It was my mission to record an awesome YouTube trailer at ClexaCon and this event was my best shot at getting amazing content. Want to see the result? Here it is. On my left was Immy and on my right was Jessica (see previous blogs for explanations) and since the place was crammed, we had to work together to get our interviews. I think we had a nice system going. I had my back to Immy, so I had the right camera angle and she had room to interview people. Jessica would stand straight when interviewing guests and when I was interviewing people, she would move her shoulder away so that she would not be in my shot. It was quite funny. This event was THE thing that made me most nervous before ClexaCon so I was really happy with how it all went down and how chill some of the conversations were. One moment I particularly cherish is when Holly, co-founder of ClexaCon, was told to move forward on the red carpet but decided to walk back to me, touched my arm, and thanked me for being there, coming all the way from The Netherlands. Are you kidding me? Thank YOU for ClexaCon and having me!! Because of my jetlag, I had only slept for five hours. So, that morning, I expected I was not going to be very energetic at the Ascension party. Who wants to miss a party like that though? Luckily, I was so pumped from the red carpet that I had an abundance of energy! Also, a Dutch/American couple had contacted me on Instagram because they had seen me walking around in my Meemoeder.com T-shirt. They were going to the party and I wanted to meet them. That means missing the party was not an option. I loved talking to them. Apparently, I take terrible selfies (note to self: try not to take selfies when a real photographer is present). That means the end of this ClexaCon 2018 Day 2 Cont. blog. Next week, you will read all about the final day of ClexaCon. That means you can read about the following panels: YouTube 2.0 – reaction videos, Doccubus & Valkubus, and Shethority. Also, you can see me being a tourist in Las Vegas. If you sign up for my newsletter, you can be sure you will be the first one to read it. You can find the sign-up form on the top right of this page or in the footer. Again, do not forget to subscribe to my YouTube channel! Thanks for reading this ClexaCon 2018 Day 2 Cont. blog!